Get rid of those old documents for free this Saturday in San Jose. We are way past Spring cleaning, but if you are among the procrastinators who still have dust bunnies in the corners and old tax documents in the tech loft, here is a way to get rid of some of the clutter for free. Normally, shredding services will cost you but this weekend Comerica Bank is teaming up with Iron Mountain to offer free paper shredding on Saturday in San Jose. "Shred Day Bay Area" gives you a way to securely shred sensitive documents which will be destroyed on site at Comerica's Winchester Banking Center at 1245 S. Winchester Boulevard. Small business owners and local residents will be able to watch their documents being destroyed. The shredder will be at the ready from 9 a.m. and 3 p.m. on a first come first serve basis. Comerica says identity theft is the fastest growing crime in the U.S. and says shredding personal documents is one of the best ways to ensure sensitive information doesn’t make it into the hands of an identity thieves or dumpster divers. There are a few rules. Only paper documents will be allowed and you can only shred four boxes or bags per vehicle. Iron Mountain will take your now destroyed documents and recycle them. Any document that has a piece of your personal information on it. This includes your name, address, phone numbers, date of birth, Social Security number, account numbers, PINs (personal identification numbers) and/or passwords. 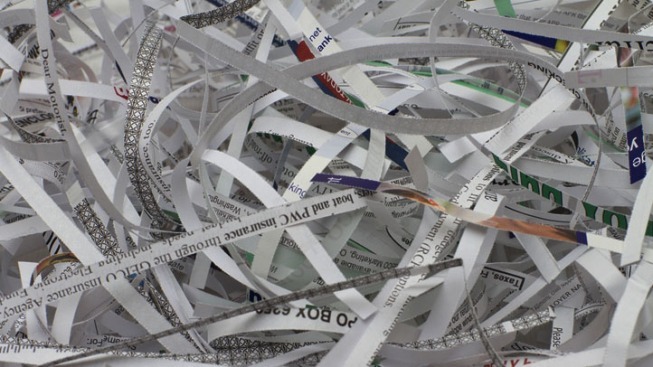 Documents that you should consider shredding include: financial records, bank statements, old bills, credit card statements and even medical records – anything that may contain a piece of your personal information. Depending on the type of document, the timeframe to keep records may differ. You should always consult with your tax or legal advisor to determine the appropriate time to keep a document. If you don't live in the South Bay or if you can't do it this weekend. Recology San Mateo County is teaming up with the City of Foster City to host another free shred event on Saturday, June 25 in the parking lot of City Hall, 610 Foster City Boulevard. You have to be a resident of Foster City to take part in this one. Residents of Foster City may bring up to five file storage boxes to be shredded for free. This event is sponsored by the City of Foster City and Recology San Mateo County. Specially trained Recology employees will shred your personal documents on-site safely and securely. Residents should be prepared to show proof of Foster City residency.